LeftyBassist.com • View topic - Post your pedal board!!! Post subject: Re: Post your pedal board!!! Just got a 105Q Bass Crybaby wah. I'll be giving it a through workout before deciding if it will be added to the board. I am also looking for a good deal on an analog echo like the MXR or a Memory Man. I have become very interested in the Tech 21 Bass Chorus but have not found one local to try out yet. Finally, I have a pedalboard! Always been too lazy to carry one, but I was getting tired of hooking two or three pedal every time. I always play with a compressor, and always bring the octaver if I'm playing 4-string. The new Billy Shehaan pedal is really nice. I love overdrive, but could never use it for much of the time because no matter what I did the bottom end dropped. Not with this one, of course. I put the Sadowsky pre on the left side so I can plug the bass on that side and not have the cable run from the right side of the board. Not in the picture, I have a cable running from the output of the Sadowsky into the tuner on the left side. 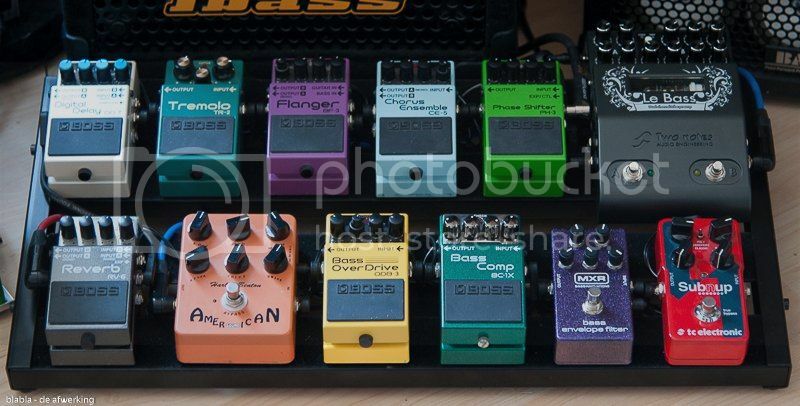 I also have an EBS BASS IQ, but I rarely get to use it and I wanted to smaller board I could come up with. How do you like the Sheehan pedal? Love it so far, man. The ability to blend the overdrive and the clean signal separately is the key, and I really like the compressor for that extra kick and sustain, and the tone control it's pretty useful, too. I haven't tried many overdrives, I must admit, just a few: the drives in the Zoom B3, Ibanez Bass Tube Screamer, and Boss Bass Overdrive, and this is by far the best. Paired with my Dimarzio-equipped P-Bass, I can't imagine a better tone right now. Having fun. I really like the Sheehan Overdrive too. And you're spot on using it with a P-Bass. I find it sounds good in general but it really shines with a p-bass. I recommend the Ashdown LoMenzo Hyperdrive too if you like the Sheehan pedal. In a couple of weeks I'm going to have a HUGE update to this thread. Addison ...... got anything you care to share with us yet? Here's my new Salvage Custom pedal board. It's a Zombie Tweed Case with a walnut board and it came out killer. I was originally told it would take 10-12 weeks and it took TWENTY-TWO friggin' weeks to get here, but they did do a really good job on it. Here's some pics of the board... I spared no expense and added a Loop-Master staggered 10-channel effects loop with tuner out and master bypass, an MXR/CAE power supply, and then wired it all up with Lava Ultramafic soldered mini plugs on Friday night... it took me until 4:30 in the morning but the end result came out killer. Zombie tweed... I'm honestly tired of the whole zombie thing, but I love this finish! Case back, showing how the pedalboard latches in. IEC plug, master power switch, and in/out jacks. I used all brass fasteners... I thought it would be a cool match to the zombie tweed and clash with the nickel hardware in a good way. Arranging, soldering and wiring madness!!! FINISHED!!! With a loop to spare! Shot of my complete rig from my gig on Saturday night... that's my own JBL powered stage monitor as well. Second shot of the pedalboard under stage lighting. your boards looks to be 1/2 the size of the Baer 2x12!!! - well, if you stood it up on it's side I suppose. Looks darn sweet! Can you give us an idea of the before and after weight totals? It's not that big, actually... 27" x 17" are the outer-edge dimensions. It has 26" x 16" of usable real estate. I never weighed it before I put it together... but I'm going to guess that the whole thing with the case weighed about 20-25 lbs... and finished it probably weighs about 40-45 lbs. I mean, it's heavy, but it's totally manageable and I can carry it in one hand with no problems. The unloaded board by itself and out of the case was really light. The effects loop switcher is actually surprisingly light... it weighs less than the wah pedal does. The beast in the equation is the power supply... it's about 5.5 lbs. Still... it's pretty big, and honestly is too big for at least half of my gigs so I won't be able to use it all the time. 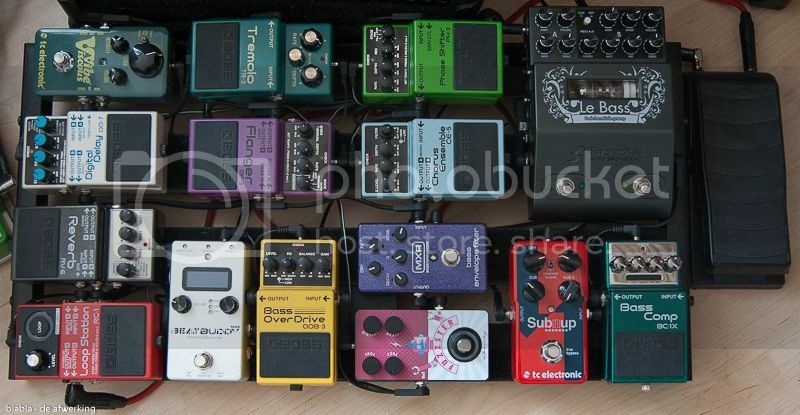 I'm putting together a mini board as well that will have all of the necessities for those gigs. Lets bring some life to this topic. Bought this board a few days ago, already owned all these pedals. And a bottom view with the cleaned up wiring. 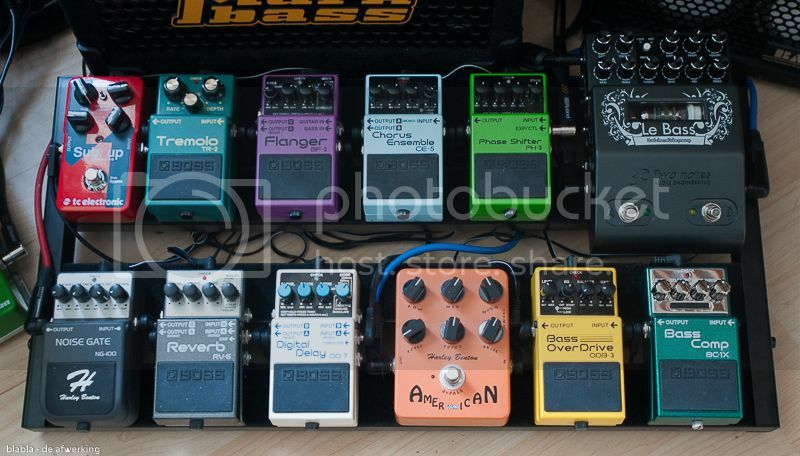 New version of the pedal board - some changes in the order, one pedal gone and a few new ones. Gone is the American Sound, it became sort of obsolete due to the LeBass. New: Simple volume pedal, Fuzzster, Viscous Vibe and Loopstation. Added the Beatbuddy to the chain, already had this one for a longer time but it was attached to different amp. Photos are not showing up for me. I'm just getting a standard 404 when I try the image links. I don't think the images are hosted at those locations anymore. 1. Digitech Vocalist Live FX: I'm a singer, so my mic runs straight into my Digitech. This enables me to control my effects for vocals on the fly, add tap tempo delays, harmonies, and arrange patches per song in set list order. There's 2 outputs - one goes to the mixer's snake and the second goes into my floor wedge. My band just purchased a Behringer XR18 digital mixer, so we will be on in ears soon and no more floor wedges needed. 2. Line 6 G10 wireless: I love this little wireless unit! No more belt pack required, you just plug it straight into your input jack. And, since I switch instruments throughout the night (I usually bring 3 basses to every gig), you simply pull it out of 1 bass and plug it into the next. It automatically mutes when disengaged with no pop or plug in noise. I keep it on the board to charge the receiver. A single charge lasts the whole night. 3. Zoom MS-60B Multistomp: My jack of all trades multistomp effects pedal for when I need that occasional effect. Some effects are excellent, IMO (Q Tron simulator, choruses) and some are not (Octaver), but it's served me well for my purposes and I like it's small footprint. 4. Boss LS 2 Line Selector: My A/B box. I used to use it as a 3 channel switch box A/B/C when I switched between 3 basses, but since I bought the Line 6 G10 I don't need to do that anymore. I still use it to switch between my normal basses and my Carvin LB50 Roland-equipped GK-3B midi bass, however. 5. Eden footwswitch (above): This is the footswitch for my Eden Navigator preamp. On board, I can mute, on/off compressor, on/off enhance, and on/off turbo boost. 6. Digitech Jamman Solo XT (not shown): This is not on my pedalboard yet, as I need to make room for it. I use this to store special effects and samples to trigger as needed (i.e. airplane sound at beginning of "Back in the USSR"). Eden Navigator preamp: Instruments plug straight into input. There's a DI outputs on back ( both pre and post effects) that goes to snake, and a Mains out that routes to the input of the Galien Krueger 400RB. Galien Krueger 400RB: The GK powers everything. I also route Mains out of Eden into GK's input, allowing me to blend preamps of both units. Roland GR33: This is my pitch to midi synthesizer. 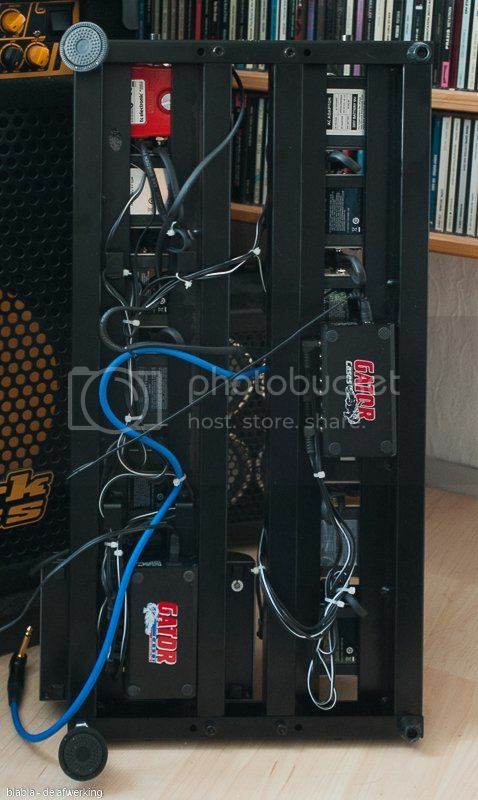 Speakers: Eden 210XLT and 210XST cabinets. And a side extension for the board. Changed some board positions, not the chain order. As far as adjustment and sound possibilities go the MXR envelope is running circles around the Mooer Bass Sweeper. The Mooer however can do something the MXR can't - add dirt to the sweep.